Organic wine is nothing new. I first wrote about organic wine more than a decade ago – but over the last couple of years, it feels like the rise of wine characterized as “organic” has mirrored the reconfiguration of many grocery store produce sections. Where once organics were a small corner of a store, now organic products are mixed throughout. Wine stores are following suit. The new label for Santa Julia wines. What makes a wine “organic?” The USDA definition has changed slightly over the years. There used to be three categories of organic wines – and that’s been reduced to two. The first are wines labeled “made with organic grapes.” Organic grapes are produced without most pesticides, fertilizers, and other synthetic ingredients. 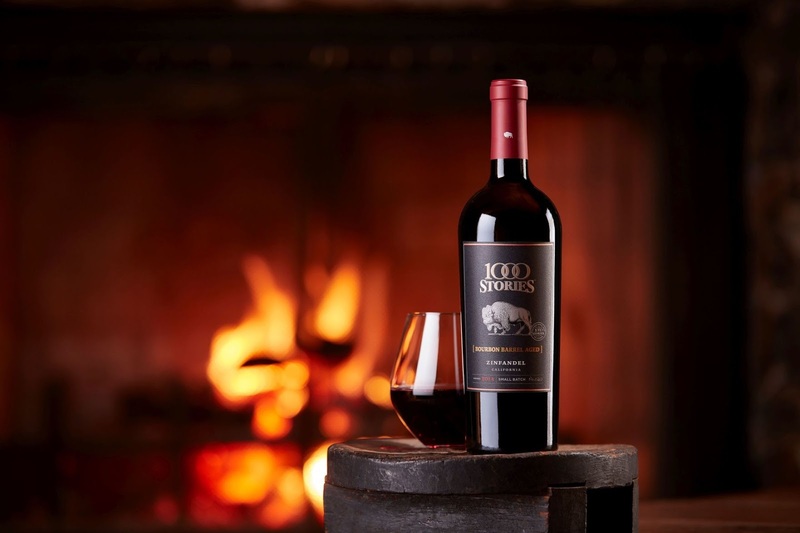 The wine must be bottled in a facility that has passed certain inspections, and must be bottled with fewer than 100 parts per million of sulfites. If a wine is labeled simply “organic,” then there are no sulfites permitted. Most organic wines you’ll see commonly are domestic in nature – which makes sense, since “organic” is a definition of the U.S. government. For an international wine to be labeled as such, the growing and production must follow the USDA rules prior to import. There are non-domestic wineries who have been doing the “organic thing” for many years, however. 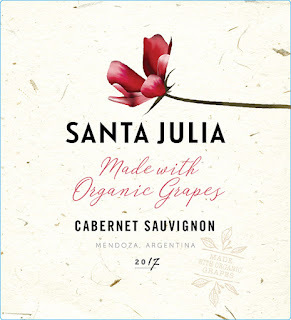 One of those, Santa Julia Organica from Argentina, has recently completed a rebranding to align with the demand for organics. Santa Julia is a product of Familia Zuccardi winery in the Mendoza region of Argentina. Under the direction of José Zuccardi – who named the wine after her only daughter, Julia – Familia Zuccardi has produced Santa Julia’s award-winning wines since the late 1990’s. They’ve designed their winemaking process to be environmentally sustainable, yet have been able to keep costs at a reasonable level. The Santa Julia Organica wines retail in the U.S. for about $11 a bottle. I had the opportunity to try three of Santa Julia Organica’s lineup recently. In short, I was very pleasantly surprised. Santa Julia Organica 2017 Malbec – At first sniff, I was met with cherries and strawberries on the nose, which I thought was interesting for a Malbec. The nose has an airy character I’d expect to find on a much lighter wine. This one’s a dark, rich violet. Diving into the glass, though, I was quickly hit with dense dark cherry flavors, along with leather, smoke, and a fairly full boat of tannin. The wine really picks up steam once it gets some air and the chocolate notes come out. Finish was lighter than I expected – there was lasting tannin, but the weight from the palate does a vanishing act, leaving behind a gentle fruit finish. Santa Julia 2017 Organica Chardonnay – I thought this was an interesting middle ground Chardonnay. The mouthfeel really stands out for me here. While there’s plenty of weight, it doesn’t get bogged down with a lot of malo-creaminess or high acidity. Nose is fragrant with peaches and green apple. The major flavors on the palate are pineapple and apricot, with a twist of lemon on the finish that lingers lemon crème-ish. As we start getting into winter, this style of white would certainly be welcome around many tables. It’s a crowdpleaser. 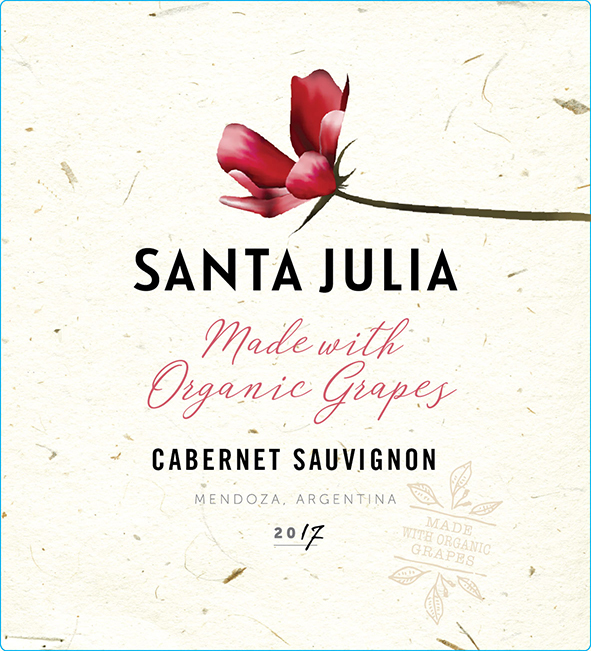 Santa Julia Organica 2017 Cabernet Sauvignon – The Sweet Partner in Crime has been on a real light-styled wine kick. Jammy zins and merlots just aren’t hitting her palate right these days. 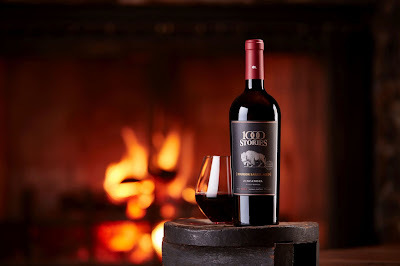 I pulled this particular Cabernet for a meal of some pork loin chops, hoping that the interesting twists of the previous two wines would follow along in this cabernet. Thankfully, I was right. This Cabernet is a leaner, smokier quaff than many cabs, even Argentinean ones. Dark cherry and cassis flavors are layered over smoke and graphite on the palate. The finish isn’t overly tannic, which was a nice change, and had a smoky, berry-filled finish that reminded me just a smidge of a Pinot Noir. A very nice food wine, as it really meshed with the sear and flavors of the chops. I’d recommend it. Santa Julia Organica also produces a Tempranillo and a Torrontes, both at the same price point. All are solid values.